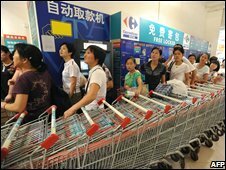 Shop shelves in China and elsewhere are being cleared of popular dairy products after tests found contamination in regular milk as well as baby formula. 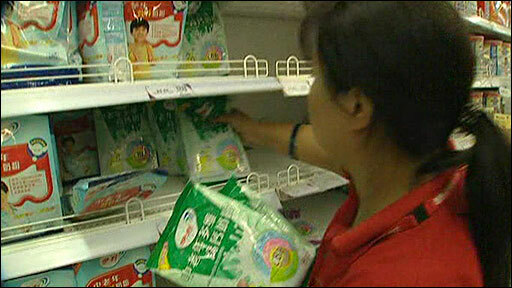 Inspectors found that 10% of liquid milk from three of China's dairies was tainted with melamine. Singapore banned the import and sale of all Chinese milk products after some were removed from stores in Hong Kong. The scandal first came to light in milk powder that killed four infants and sickened more than 6,000 others. Suppliers are suspected of diluting milk to cut costs, then adding melamine to make it appear higher in protein. Melamine is an industrial chemical normally used in plastics, and is banned from food stuffs. China's quality watchdog, the General Administration of Quality Supervision, Inspection and Quarantine, tested ordinary milk from three dairies. Its website said 10% of the milk from the country's two largest - Mengniu Dairy Group and Yili Industrial Group - contained up to 8.4 milligrams of melamine per kg. Products from Shanghai-based Bright Dairy were also contaminated, it said. Although Chinese officials sought to allay panic by insisting most milk was safe to drink, reaction to the news was swift. In Singapore, the Agri-Food and Veterinary Authority banned the import and sale of milk and all milk products after local tests discovered melamine in products from two Chinese-manufactured brands. Two Hong Kong supermarkets, Wellcome and Park'n Shop, on Friday cleared their shelves of Mengniu brands. A day earlier, the Hong Kong government recalled Yili products, after tests found milk, ice-cream and yoghurt to be contaminated with melamine. Starbucks stopped offering milk supplied by Mengniu at two-thirds of its outlets across China, although it stressed none of its staff or customers had fallen ill from the milk. The EU and the US said they wanted to know how the scandal was allowed to develop - in order to ensure future overseas confidence in Chinese exports. Meanwhile, foreign firms which import milk powder to China have pledged not to take advantage of the scandal by raising prices, Reuters news agency reports. In China, the General Administration of Quality Supervision, Inspection and Quarantine said it would "strictly find out the reason for adding the melamine and severely punish those who are responsible". All the batches that tested positive were being recalled, it said. The BBC's James Reynolds in Beijing says it is not being suggested that anyone has fallen ill from drinking liquid milk contaminated with melamine. But he says people are extremely angry to learn that more and more products have been found to be unsafe. One 31-year-old man queuing at Sanlu offices in Shijiazhuang to get a reimbursement for medical exam payments for his baby told Associated Press news agency: "If such a big company is having problems, then I really don't know who to trust." The scandal broke last week after the Sanlu Group said it had sold melamine-laced milk powder. Of those children made sick, more than 150 are said to have acute kidney failure. Chinese police have arrested 18 people in connection with the scandal. China's ability to police its food production industries has long been under question. Health scares and fatalities in recent years have ranged from the contamination of seafood to toothpaste and, last year, to pet food exported to the US.